Dr. Claudia C. is on a mission to help talented and ambitious women rock the stage, deliver legendary speeches, and get the standing ovation that is their birthright. For this reason, she founded The Women Speak Up Project, a business that supports women in sharing their message, changing the world, all while growing their influence, impact, and net-worth. In her career as a women’s public speaking coach, speech writer, and college professor, Claudia has accrued more than 3000 hours of public speaking–quite the feat for a consummate shy girl! She is regularly invited to speak at prestigious universities across the US and Canada, such as the University of Arizona, the University of Maryland, and the University of Toronto. Claudia describes a type of fear that holds women back from showing up completely when they take the stage. She explains that it’s deeper than stage fright, it’s an ancient fear that can been seen throughout history and manifests itself in a physical reaction. She shares her insights on why a lot of women lean backwards when they are speaking from the stage, and gives a few small tips to help with that. In contrast, she describes what a confident woman looks like on stage, and what might be going through her mind as she delivers her message. Claudia refers to agency, which is another way of saying power, and how a woman can gain more of it, and respect herself more, regardless of what’s happening within her surroundings or situation. She and Dana also talk about the women in history, and how they’ve had a much shorter time span operating within positions of power. She crosses her fingers to the birth of a new era as women begin to come to the forefront about their experiences. 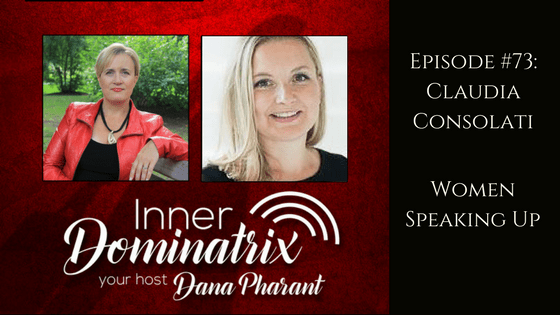 She also talks about channeling source, and shares a few playful tips that can make a huge difference in stage confidence, and body connectivity. Claudia ends the show with her thoughts on the societal dialogue toward women, and what needs to change, and leaves off with a few poses and stage tips to help with appearing and feeling more confident on stage.